Did that mean they tasted like cotton candy? Or was it just a strange brand name? I had to try them. And when I did - WOW! They really do taste like cotton candy! The first bite was disorienting, sweet and candy-like, just like the spun sugar itself. I couldn't believe that what looked like a normal grape tasted like something completely different. As I continued chewing it, it tasted more like a normal grape - but when I popped another one into my mouth, the first bite again surprised me with its cotton-candy flavor. I had never heard of these, and only spotted them by chance in Whole Foods. But I'm glad I did - they're kind of awesome! I want to serve these at my next party and see my friends' reactions! 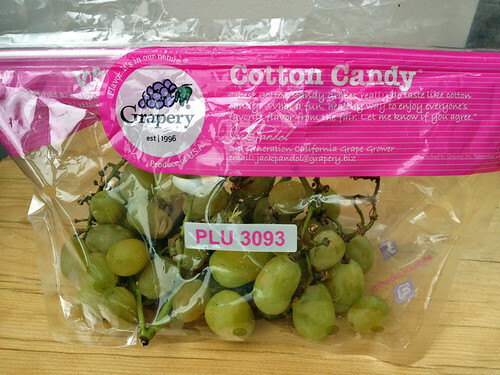 Check the Cotton Candy Grapes website to see other locations where they are sold. Veggie Burgers in the "News"